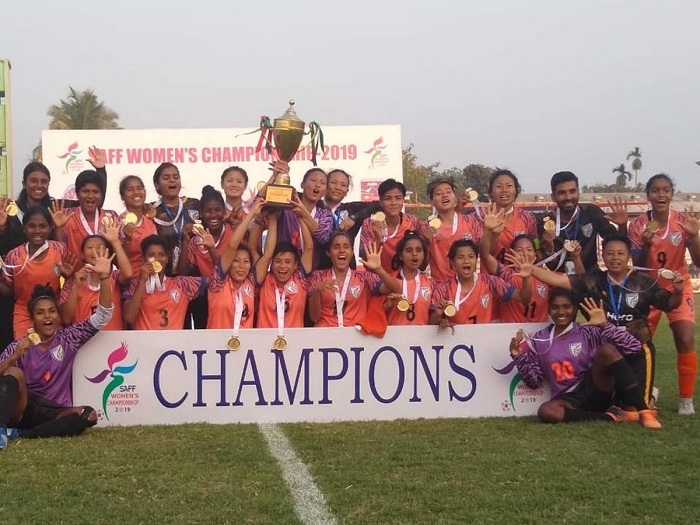 India retained the SAFF Women's Championship title, beating hosts Nepal 3-1 in the final of the fourth edition at the Sahid Rangsala in Biratnagar of Nepal on Friday. Dalima Chibbar opened the accounts for India in the 23rd minute after converting a free-kick from foul by Nepali defenders near 30 yards. Nepal found the net in the 33rd minute with a six-yard-header from Sabitra Bhandari who shared the top-scorer title with India’s Indumati Katheresan with four goals. Both the teams went to half-time with scores tied at 1-1. In the 62nd minute, Grace Dangmei capitalised on Nepal’s defensive slip and ran past Goalkeeper Anjila Subba into the box and shot to goal giving India a 2-1 lead. Also, Anju Tamang ran rampant over Nepal’s defence in the dying embers of the match and struck a fatal blow to Nepal’s title hopes taking the tally to 3-1. Despite mounting substantial pressure against India’s defensive lineup, Nepal – as the day ended – had to settle for runner up title yet again. With this, Nepal has clashed with India in the SAFF Women’s Championship finals for four times without a win in their records. On the contrary, India has retained the champions’ title for the fifth time continuing their dominance in South Asian Women’s football.